St. Innocent Orthodox Church - What Do You Want Me to Do For You? Just let that sink in for a moment. That God, Who set the world into motion; Who spoke everything that we know into being; Who gave us life and, in a moment, can take our life away; that God…asks us what we’d like for Him to do. And what that means, of course, is that we’d better be careful about what we ask for. But it also means that, given all the troubles of this world; given all the fires – both literally and figuratively – that God is putting out; given all of it, we can’t waste His time. This blind man could have easily explained the whole story of his blindness and how he’s suffered terribly from birth and how no one understands him, no one ‘gets’ him, no one cares about him—how he’s got no friends, no help, and no joy in life. He could have said all of that. 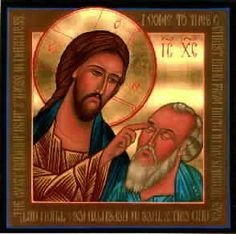 But this blind man realizes what we so often forget: that God’s mercy is not won with long prayers or big words or detailed explanations. If that were the case, He would have told us to be like grown-ups. But, instead, He tells us to be like little children. Yes, what He wants most is for us to come to Him as a child comes to his or her own father – a father who’s got a lot going on, but a father who always has time for his children. He wants us to come to Him with joy and peace of mind and, most of all, with hope—with hope that He will listen. And with hope that, no matter what He gives, He gives for our good and not for our ill. It is as St. Bernard of Clairvaux once said: When you ask God for something in prayer, He will either give you what you [want] or something better. And that, I think, is important for all of us to remember these days; these days when, even though it has warmed a bit outside, the daylight remains short. Some of us go to work in the dark and come home in the dark. Add to that the fact that Pascha is earlier this year, and so the Great Fast is quickly approaching. Bundle all of that up, and it’s at this time of year that it becomes somewhat harder to pray, not because we don’t want to, of course, but because the evil one is working overtime. He is working overtime, trying to convince us that if our prayers aren’t long enough or fancy enough or eloquent enough or painful enough, then they aren’t really good enough. But you only need to remember this Gospel reading to know that this is hardly the case! “What…do you want me to do for you?” Go ahead and tell him. Be bold. Be honest. And trust, as St. Bernard said, that He will either give you what you ask, like the blind man or, if it pleases Him, He will give you something better!